At 1920 GMT yesterday evening (7 January), and only an hour-and-a-half after passing Cape Horn, Vincent Riou called his shoreteam to report that PRB has been dismasted. Riou called his team and said bluntly: “We have been dismasted. We are in the islands.” When the call was made PRB was in a position approximately 55 deg S and 65 deg 59 W, about 7.8 miles to the North West of the Cape Horn light. 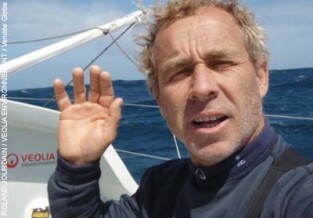 Both skippers Riou and Le Cam are safe and well. He called back to his team about an hour later, saying that he did not want to issue a Mayday signal, but was trying to locate a suitable vessel to tow them. Since then – at 01:45 this morning – the Chilean Navy patrol vessel Alacalufe took PRB under tow. The yacht was due to arrive in Port Williams – the ‘southernmost town in the world’ – at around 08:45 this morning. The skippers believe that the temporary lashing which they had made to the chain plate gave way. They had around 25 knots of NW’ly wind when the rig came down but have a limited chance of setting a jury rig while they are in the islands. Riou and Le Cam acted quickly to cut away the rigging and free the broken mast. At the front of the fleet Roland Jourdain (see right, Veolia Environnement) and leader Michel Desjoyeaux (Foncia) are now separated by over 250 miles west to east and Jourdain is now effectively further north, but still computed to be second by 105 miles. Based around the distance to finish calculated using the theoretical route, Roland Jourdain seems to be well placed to challenge Michel Desjoyeaux. 250 miles further west, the skipper of Veolia Environnement is already 20 miles further north than the current leader. The two are not tackling the small low-pressure systems off the coast of Argentina in the same way and with a lead of only a hundred miles the position of Michel Desjoyeaux does look tenable, racing in 20-25 knots of SW’ly winds. The fight is on and there will be plenty of opportunities for tactical plays with major upsets possible. Armel Le Cléac’h (Brit Air) is experiencing much quieter weather and is heading due north at 12-15 knots after rounding the islands off the tip of Patagonia. Sam Davies (Roxy), who can expect to be promoted to fourth place when PRB’s expected retirement is announced, has had to replace her boom vang overnight, and is making steady progress again with Cape Horn 1000 miles ahead of her. She is taking a southerly route, only 100 miles north of a set of well-tracked icebergs. Behind her Marc Guillemot (Safran) has a deficit of about 390 miles but has indicated again that he is minded to stop again to repair his mast track. In effect he has a net 50 hours of time compensation over Sam to be subtracted and may spend some of that trying to be repair his mainsail luff track for the climb up the Atlantic. For once the Pacific is peaceful too. Brian Thompson (Bahrain Team Pindar) is making a steady 9-10 knots and was about 130 miles from the SE Pacific gate, the final one, at 04:00 this morning. Dee Caffari (Aviva) is back up to speed this morning in better breeze but has lost out to Arnaud Boissières (Akenas Veranda) overnight who is 28 miles ahead. Steve White (Toe in the Water) struggles to escape the clutches of a high and this morning was only advancing at 1.5 knots but had reported again that he will be taking opportunities presented to work on the re-calibration of his auto-pilots. At the trailing edge of the fleet, Raphaël Dinelli (Fondation Océan Vital) is also stuck in light airs off Stewart Island as is Norbert Sedlack (Nauticsport-Kapsch), who can look forward to a quiet day, giving him time to give his boat a thorough inspection, but will scarcely reflect on the fact that leader Michel Desjoyeaux is now this morning closer to the finish in Les Sables d’Olonne than they are to him.